Full-term pattern cerebral palsy comes in two varieties, one of which can be helped by a Baclofen Pump. The major indication for use of a pump in a child with cerebral palsy is severe and unmanageable spasticity that usually involves all four limbs in a quadriplegic pattern. Pumps are also used with children who have had a head injury and in near drowning situations where again, spasticity maybe high. If a newborn infant had classic hypoxic ischemic encephalopathy, which means brain inflammation and damage secondary to low oxygen and/or low blood flow to the brain over a prolonged period of time, the most common area of damage is in the parasagittal boundary zones shown in black on the diagram. A smaller number of babies have a stroke affecting the middle cerebral artery. 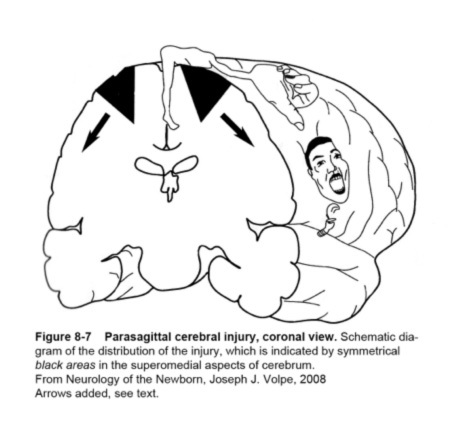 Extensive parasagittal injuries and/or MCA stroke affect areas indicated by the arrows I have added to the diagram. If the damage is on just one side of the brain, the result is hemiplegia, affecting one side of the body. If it is on both sides, result is quadriplegia, affecting all four limbs. The areas that are most involved are the trunk, arms and speech, with less tone and control problems in the leg(s). Seizures are more common, as is some degree of cognitive delay in the most severely involved. The higher incidence of these associated problems in the full term pattern of brain damage is due to the fact that the damaged area is in the cortical gray matter. Baclofen has been used orally for many years in children with severe spasticity, with not very impressive results. The dosage required to get therapeutic effectiveness in the child’s spasticity nearly always comes with unacceptable side effects including lethargy, feeding problems and impairment of cognition. Delivering the same drug, through a small catheter into the intrathecal space, directly to the spinal cord nerves, has proved to be beneficial in appropriately chosen individuals. The technique has a long history in adults with spinal spasticity after spinal cord injury as well as in various degenerating disorders such as multiple sclerosis. Both a Selective Posterior Rhizotomy and a Baclofen Pump insertion require surgery. However, there are more follow-up requirements for continuing medical care of the pump. As in many surgical procedures, the results are best in the centers that do the most cases. The initial indication for a Baclofen Pump was for children with unmanageable spasticity and the goals were limited to improvements in nursing care and perceived quality of life. As surgeons and rehabilitation specialists have gained more experience with the technique, it has been more widely used and in children with lesser degrees of spasticity. There can be technical problems in placing the pump in very small infants and toddlers and the incidence of complications is obviously higher. However, there is a growing usage of pumps in teenagers with moderate and even mild degrees of spasticity that interferes with their quality of life and aspirations. Of these two surgical choices, I would be very cautious of any web-based information source, my own included, that offers individual advice without a patient assessment. That said, what is a parent to do? I believe the best first line is to discuss it with your physician that you normally see for cerebral palsy care. That person would be a good source of local experience and could refer you to a spasticity management team for assessment. Since both a rhizotomy and pump can be used in overlapping diagnostic categories, I advocate going to a team that has experience with both techniques. If that is not locally available, then I suggest you request a referral to a team that predominantly uses Baclofen and another team that predominantly uses a rhizotomy. As Dr. Jerome Groopman explains in his book, “How Doctors Think” (How Doctors Think), what doctors tend to prescribe varies with their training and experience. We all fall into the cognitive bias of advocating the techniques with which we are most familiar. As a parent, you need to learn about both techniques before you can make a rational decision that is best for your child and family. If the child is now a teenager, it is useful for them to see what is available. Remember, the teen has no experience of life without spasticity. I believe they should have the opportunity to learn more about currently available techniques. Most centers have families with teenagers that would be willing to discuss the procedures and results with you. If you are considering either of these surgical management techniques for spasticity, I suggest you reread my spasticity series from the beginning. (Spasticity Series) It will give you a sense of how much difficulty from spasticity your child might run into as they grow through puberty. A heavily muscled, big-boned boy, who is growing quickly, will likely have more problems than a lightly muscled, small-boned girl who has a slow and steady pubertal growth spurt. Spasticity is affected by speed of growth and the quality of the child’s muscles and bones. Again, the spasticity management team can help you sort through some of these variables. The team can give you a better idea of the individual prognosis for your child and also be able to tell you how much benefit you may expect. Below are a series of links that will give you an overview of the 2 techniques, their indications and complications. Next week, I will write about movement disorders. Athetosis and Choreoathetosis are two complications that are more common in the full-term infant than in the preterm infant. SDR is not indicated for these patients. Baclofen pumps have been used for some patients with troublesome dystonia, but it is not usually recommended for Athetosis. This is the link to a review article by Dr. Leland Albright, one of the most experienced surgeons with pumps. (http://jcn.sagepub.com/content/11/2/77.abstract) The full article is available for purchase or you may access it via a spasticity management team. As ever, I look forward to your questions and comments.